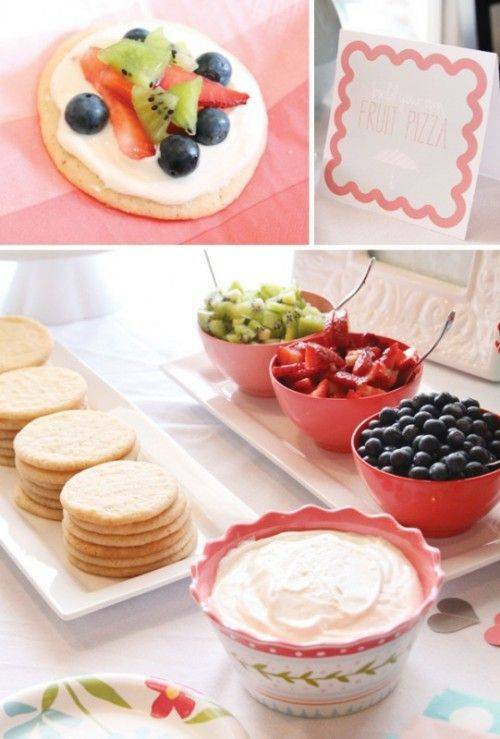 If you’re looking for the ultimate food choice for your wedding shower or the wedding shower you’ll be hosting, the fruit pizza bar is an excellent option. Not only is it fun and easy to set up, but you can give your guests a lot of different options to ensure that they’re all satisfied. Sugar Cookies – these will be your pizza “dough” and you can cover it with various toppings. Cool Whip Mixture – this will be another choice of sauce. Vanilla Frosting – this will be another choice of sauce. Sliced fruits of various kinds. Sugar and cinnamon in a shaker container. The cream cheese mixture is easy to create. Simply allow an 8oz package of cream cheese to come to room temperature, and then mix in ½ cup of any preserve or jam. This creates a spreadable, delicious topping that tastes fantastic with the sugar cookie. To create the cool whip mixture, simply mix 1 container of cool whip with ½ cup of any preserve or jam. This gives guests a choice of sauces. The vanilla frosting will give them a third choice. You can also mix up your sauce options. For instance, you can create 3 types of cream cheese mixture by using orange marmalade, strawberry preserves and apricot preserves. Or, you can create several types of cool whip mixture; it’s totally up to you. Place these mixtures in small bowls with butter spreaders and place sliced fruit in various dishes with spoons available. Some options include sliced strawberries, grapes, kiwi, watermelon, cantaloupe, etc. The sliced cheeses can act as a counter to the sweet fruit, and guests can top their “pizzas” with the sugar and cinnamon mixture for an added treat.